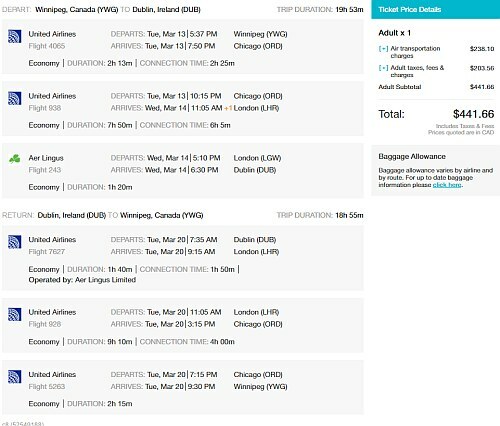 I'm seeing some interesting fares from Winnipeg to Dublin, Ireland for $441 CAD roundtrip over St. Patrick's Day. There may also be other dates throughout 2017 and 2018 that are available for a similar price. However, most of these flights have 2 stops each way, using a combination of United Airlines and Aer Lingus and are pretty long flights. And it's not really clear whether these prices are a mistake or not. I'm only seeing them verify on a few booking sites. Try focusing on Monday, Tuesday, Wednesday, and Thursday dates. I've had pretty good luck with Tuesday to Tuesday dates. So far I've had the best luck when the booking site is Flight Network. When it's GoToGate, it seems to be hit or miss (sometimes the price verifies as shown on Momondo, sometimes it jumps up). Update 9/20 - @ 10:30 AM CST - I've seen reports of some of these bookings being cancelled, while others were issued an e-ticket. Flight Network : People are reporting that their bookings made through Flight Network were cancelled. CheapOAir.com : Those that were issued an e-ticket still have their bookings and all seems fine so far. GoToGate : I haven't really seen any reports either way. These 'mistake fares' are still showing up today. I would focus on booking with CheapOAir.com for the best chance of being issued an e-ticket. 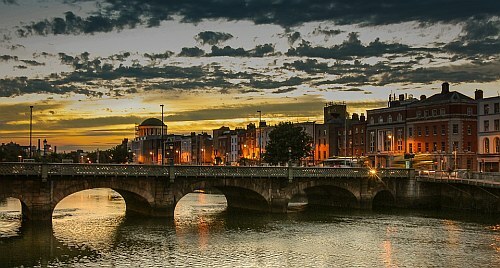 winnipeg, ywg, flight deals, europe, dublin, ireland, dub, northern europe, western europe, united airlines, aer lingus, shannon and snn.